Just as Edward found himself checking out his strange, stylized and fantasized fifties suburban setting, so did a handful (well, four fingers worth) of newer world photobloggers, including the Bent's resident shooter. We all (Edward and the four of us) were in the comfortable confines of Seattle's 5th Avenue Theatre for a reason. Mr. Scissorhands to make an entertaining spectacle of himself The four photogs to capture the first 30 minutes (more pictures), as unobtrusively as possible. 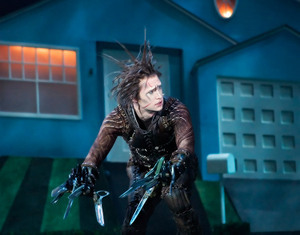 The occasion was the opening night of the Seattle run of the Edward Scissorhands North American Tour, Matthew Bourne's adaptation of the Tim Burton film - a musical play without words best described (video) by Matthew himself. A dialog-free music and dance adaptation of a film is somewhat experimental, at least in my experience. Our hero, Edward, was the loving experiment born of tragedy, in his grieving father's lab. And the invited presence of of photobloggers was a experiment in viral marketing of mainstream theater. This entry is a lab result. You have become part of the experiment. The show, as evidenced by a sustained standing "O", was wonderfully, and somewhat unconventionally, entertaining. The audience, save those few who wondered where the words went, loved it. Real critics felt 'Edward Scissorhands' - "wins some, looses some" - R.M. Campbell, P-I Dance Critic, and "makes the cut as a hybrid of dance and drama" - Meisha Berson, Seattle Times Theater Critic. As for the marketing test, it remains to be seen. It was a welcomed opportunity and seems well suited to our new media landscape. In both cases, the Bent says, "Two blades up!" I love the ES collection. The pictures put me in mind of the photorealism school of painting. The experiment is a great success in my view! "a musical play without words"
"somewhat experimental, at least in my experience"
Yes, this is the DEFINITION of "unfamiliar territory." It is interesting that you participated. I'm glad you did. This is interesting to me, in that I would not normally be interested in such things... but you make a solid case.